Bam… another smartphone has just hit the streets of Barcelona. The Galaxy S II is the “world’s thinnest smartphone” at 8.49mm. The Gingerbread (Android 2.3)-powered phone has a 4.3-inch 800×480 Super AMOLED screen. No availability but it runs HSPA+ so expect it on T-Mobile or AT&T. BARCELONA, February 13, 2011 – Samsung Electronics Co. Ltd., a leading mobile phone provider, today announced the Samsung GALAXY S II (Model: GT-I9100), a beautifully thin (8.49mm) and lightweight, dual-core smartphone that combines an unmatched viewing experience with incredible performance. The Samsung GALAXY S II uses Android™ 2.3 Gingerbread, the latest version of the world’s fastest-growing mobile operating system. The next generation smartphone includes access to Samsung’s four new content and entertainment hubs, seamlessly integrated to provide instant access to music, games, e-reading and social networking services. 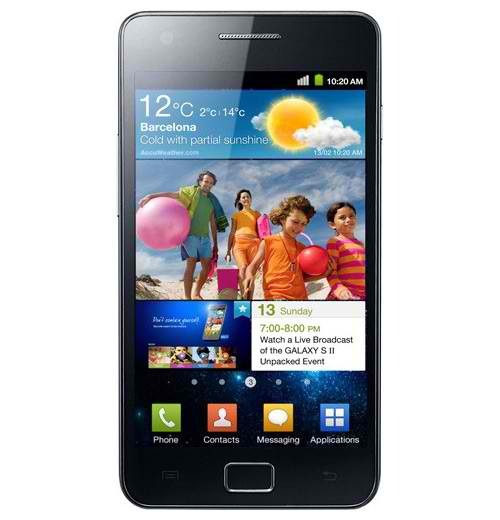 Incorporating a dual-core application processor and advanced wireless network (HSPA+ 21) connectivity, the Samsung GALAXY S II has the speed and power to provide an unrivalled mobile performance. Dual-core application processor delivers compelling features such as fast web browsing, multi-tasking comparable to a PC-like environment, supreme graphics quality and instantly responsive 3D user interface on the large screen. The GALAXY S II also delivers seamless multitasking, switching between applications instantly. Superior 3D hardware performance makes games and video incredibly fast and smooth. With super-fast HSPA+ connectivity, the GALAXY S II offers rapid mobile download speeds while BlueTooth® 3.0+HS considerably reduces data transfer times. The Samsung GALAXY S II has been equipped with an 8MP, high-profile camera and camcorder with 1080p full HD recording and playback. With Samsung’s patented AllShare technology, customers can capture, create and then share their experiences hassle-free. The Samsung GALAXY S II has been equipped with Samsung’s new crystal-clear Super AMOLED Plus screen, the most advanced mobile visual display ever created. Setting the standard of quality viewing on mobile, Super AMOLED Plus introduces the best in quality in color gamut, contrast ratio and edge sharpness. Using RealStripe screen technology and a greatly increased sub-pixel count, Super AMOLED Plus complements the mechanics of the human eye to recognize images look clearer and more detailed than ever before. With a wider viewing angle and increased visibility in outdoor, the Samsung GALAXY S II provides a more vibrant viewing experience than any other mobile devices. • Social Hub Premium: The future of communication – talk to whoever you want, however you want, all from one place – your contact’s list. Communication history, IM status, and updates from social networking sites are all readily available. From here, users can access all types of messages (push e-mail, text, VM and SNS) and respond directly without resorting to individual applications. It truly acts as a hub for entire social life. • Readers Hub: Carry an enormous library of books, magazines and newspapers on-the-go. Through strategic partnerships, Samsung Readers Hub provides over 2.2 million books and novels, 2,000 global and local newspapers in 49 languages and 2,300 popular magazines in 22 languages. • Game Hub: The easiest way to download and play best-in-class mobile games. Featuring a 3-axis gyroscopic sensor, the Samsung GALAXY S II unleashes a world of gaming possibilities. Try for free and download premium titles from partners like Gameloft, or ‘enjoy Social Network Games (SNG) powered by mobage including ngmoco’s We Rule and We City’. • Music Hub: Make Samsung GALAXY S II a personal music manager and access over 12 million tracks from 7digital. Discover what’s hot from top charts, search for favorite music, get recommendations on albums, enjoy previews and download them directly to Samsung GALAXY S II. With the enhanced voice technology on the Samsung GALAXY S II, customers will be able to do more with less. From opening the app to controlling the messaging, social media, email and calling, Samsung Voice Solution will recognizes voice and convert it to text and vice versa. Customized Voice Translation application makes the Samsung GALAXY S II the perfect travel companion, translating voice or text into – and from – a range of languages: simply speak a word or phrase into the handset and it will instantly translate it, with audio and text output.